What is meant by cylinder row and cylinder bank? Cylinder row and cylinder bank is the two terms often used in describing different types of cylinder arrangement of the engine. It is the arrangement engine cylinder in which the centre line of crankshaft journal is perpendicular to the plane containing the central line of engine cylinder. It is the group of radial engine lying in a plane perpendicular to the crankshaft axis. If the radial engine has more than one row of cylinder then it is called multi-row cylinder. It is the arrangement of engine cylinder in which the centre line of crankshaft journal is parallel to the plane containing the central line of the engine cylinder. Cylinder bank is the arrangement of cylinders parallel to the crankshaft. If the engine has a large number of cylinders, then cylinder arrangement having more than one cylinder bank is adopted. 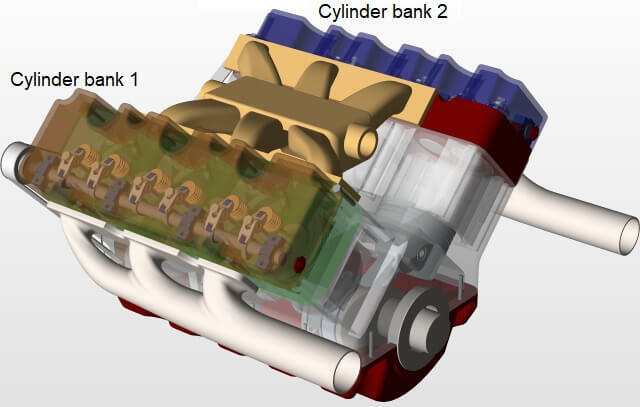 For example the for V engine there are two cylinder banks. The angle between these two is known as bank angle. What are the advantages of Multi-bank cylinder arrangement? Multi-bank arrangement helps torsionally stiffer construction of crankshaft and crankcase. Multi-bank cylinder arrangement shortens the length. Engine cylinder can be arranged in such a way that it achieves well balance and fewer vibrations.